Hello and Welcome to Karen's Creative Designs. I have been enjoying making cards for about 6 years now. I started out making Scrapbooks for the Grandkids. Searched You-Tube for techniques for background and found Gina K.Designs. I was hooked and just had to make cards! I have always been one to have a craft of some sort to do. I have done some crochet, jewelry making, pottery, cake making, ect.... you get the picture! I am hooked on card making and I love that it brings a smile to someones face when they receive a handmade card! Welcome Back to Day 2 of our Blog Hop! We are so glad you hap hopped in for a visit and some inspiration! The team is rocking this hop as We are Featuring some more Fabulous sets. Here are the cards from the Release Party! Look at all the fabulous word dies too! Here are two cards I did some ink lifting on! Up Next is Hugs and Wildflowers Stamp Set and matching Dies! I love creating with this New Set by: Lisa. I wanted it to look like watercolor and a bit whimsical so I did off set on the flowers line art and the solid image. Here are the Supplies I used to make this one! Thank you for hopping by and spending some time with me today! Up next is Melanie Muenchinger with her Fabulous Creations! Hi Everyone and Welcome! Thank you so much for joining us today on our hop! Today we are Featuring a couple of new stamp sets! We have the New Set By: Melanie Muenchinger – ” Puppies Galore” This set… is Lots of fun and sweet puppies can be made with it. I love that you can change the ears and have a different puppy. It was like playing with my paper dolls and changing the clothes. You get to change the ears with this set and add a collar, or a scarf! 🙂 Then we have the New Set By: Beth Silaika – “For the Grad”. Love the greetings in this set and I think this set will be great to use for someone you want to send a encouraging card to. If it is a pre schooler or a Collage Grad and every thing in between! I also used the Smile Stamp set and Smile Die on the cards in the Gallery Above. Also the Heart Stamp Set and Die for the card Featured Below. Gina K. Designs will have a $50.00 Gift Certificate for someone that comments on our blogs. Be sure to comment for your chance to win! ❤ Gina K. Designs will post the Winner over on her Blog on Friday April 19th. First up is Puppies Galore By: Melanie Muenchinger This little Puppies Galore Set is just so sweet. Here is the card made for todays hop. What a great set for the grad in your life! For the Collage Grad or the Preschool Grad this set will fix you up! April 12, 2019 April 12, 2019 by karenrhightower3 Comments on Monthly Mix Challenge! This Months Challenge is Hosted by: Mindy Eggen! Along with some Oxide Inks for my background. I Blended them together with Picket Fence – Life Changing Blending Brushes. I love how easy these brushes are to blend ink and to clean up! I don’t have the full set of Oxide Inks but I do have some and here are the three I used for this card! Fossilized Amber, Twisted Citron, & Peacock Feathers. I used a little water and some reindeer – Black Onyx to add the droplets on the background! Welcome to my blog today! I was asked to Guest Design for Ink On 3 for their New Release using the New Stamp Set – Heels To You! So many ideas running through my head with this set. I love that sweet Magnolia in this set. I made two cards and the first one is done masking off the flower and stamped in Fadeout Ink then did some watercoloring! Stamp Set – Heels To You! For the second card I made, I used the Coordinating Dies with this set! Stamped it with the Juicy Clear Embossing Ink and Die cut the words out 3 times. Stacked them together using Gina K. Designs Connect Glue! There are so many fun new things! There are 9 new Glitz Glitter Gels -Bubblegum, Sweet Mango, Gold, Grass Green, Turquoise Sea, Wild Lilac, Black and White! And the New StampnStencil™ System. 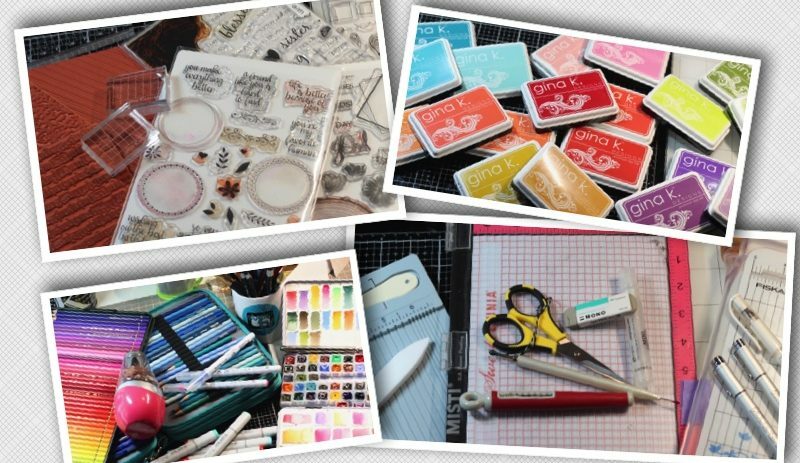 There are Stamp Sets, Coordinating Stencils, along with matching Dies. Crazy Daisy, & Petals and Wings. Along with a New Sheer Satin Fancy Ribbon – White/Silver. 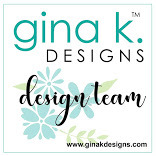 Be sure to leave a comment on all the blogs for your chance to Win a $50.00 Gift Certificate from Gina K. Designs. Gina K. will post the winner on Friday the 29th. This card was made with the Crazy Daisy StampnStencil Stencil, & Petal and Wings Stamp Set and Dies. I also used the Glitz Glaze Gel in two colors on the stencil. I used the the same supplies as the card above, just added a extra butterfly instead of the lady bug, and then made it a Tent Topper Card. I have been having lots of fun creating with these New Sets and Glitz Glitter Gel. On this card I used the Crazy Daisy StampnStencil Stamp Set, & Stencil. I used White Pigment Ink and some brushed and applied the ink over the stencil, then stamped the Crazy Daisy Flower in the White Ink as well. Grabbed my Prismacolored Pencils and colored the Flower and Leaves. Used a Gel Pen to add little highlights to the flower and stencil. Stamped the Greeting in Jet Black Amalgam Ink.